A short note to point out that the self-adhesive Poppy stamp is on sale again - probably only until next week. This was mentioned as the lead item in this post, but some people missed it thinking that that post was only about Post and Go stamps. 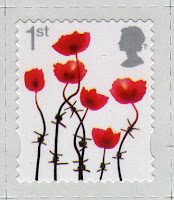 On Monday, Winter Greenery Post and Go start again, so probably this is the last chance to get the new Poppy Post and Go stamps from Post Office SSKs. It's an appropriate time to draw attention to the box at the top left of the blog page. This search box is very useful for finding particular words or phrases and will quickly help you find recent and previous instances of something that you are either sure has been mentioned but can't find it, or ought to have been mentioned and can't find it. Remember that the listing generated may not be in chronological order. Also, if you're just browsing, click on the "Next Blog": there is probably a 98% chance that it won't be about stamps, but you may find something else interesting! I am confused again in relation to the information that the Winter Greenery P&G will be reissued on Monday 13th. I have just spoken to TH and they have no information regarding this, can anyone help? That's because Tallents House are not involved, although this reissue is mentioned on the back page of the November Philatelic Bulletin. Thank you very much Ian, no longer confused.